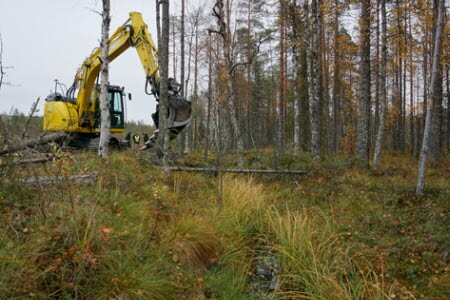 SCA is restoring a 50-hectare wetland area in Bjursjömyren in Ångermanland, Sweden, in cooperation with the Västernorrland County Administrative Board. The restoration of the bog will benefit birds and other animals and reduce carbon emissions. 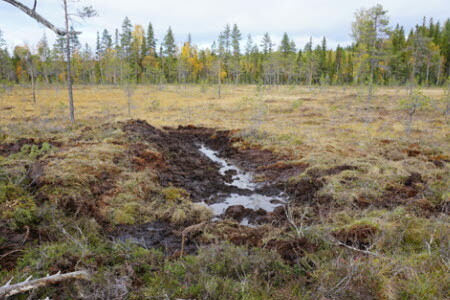 Bjursjömyren, a part of SCAs conservation park Sörgraninge, has been heavily drained similar to many other bogs in Norrland. Large areas are now fairly dry and many ditches have become lined with a screen of pines and birch trees and sections of the previously open spaces are now partly overgrown with bushes. Ditching the bogs was a major operation in the 1950s and 1960s with the aim of creating more land for forestry. However, the peat was often too deep for the ditching to achieve the desired ffect. “You can see that growth increased for the first few years following the ditching in the annual rings of the pine trees closest to ditches, but after 15-20 years this slowed again,” says Mikael Berg, who is responsible for the conservation park. And now Bjursjömyren will be restored to the bog it once was and benefit birds and other animals that thrive in a wetlands habitat. SCA owns the land and is collaborating with the County Administrative Board, which is responsible for work restoring the wetlands. Two excavators have worked this autumn to refill the old ditches. Bogs and wetlands play a key role for the environment. They capture and bind nutrients and heavy metals from the surrounding land. This produces better water quality and watercourses flow more evenly. In itself, the bog is also a valuable habitat for many species, including wading birds, batrachians and insects. “The entire length of the ditches is being refilled, but large dams are being created at regular intervals. These are about 10 meters wide and made from logs that are driven into the bog to create a dense fence. Peat and geotextile is then packed around the fence to seal it. 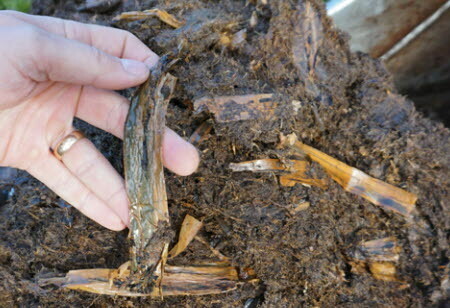 The hole formed where the peat has been extracted is quickly filled with water, creating a small pool,” explains Andreas Fahlén, who drives and owns one of the two excavators working in the bog. “A refilled ditch is hardly visible and the peakes formed at the dams will collapse and become more compact so the bog will appear completely natural again after a few years. Certain birds on the bog want completely open spaces before they dare to breed and SCA will therefore remove bushes and small-diameter trees that have grown up along the ditches to recreate open spaces. “We hope the groundwater will rise so much that we can see larger water mirrors on the open surfaces. The standing water in the dams will hopefully also benefit batrachians, such as northern crested newts. Bjursjömyran is located in the Sörgraninge conservation park and the restoration of the bog is one of many measures carried out by SCA to recreate or preserve conservation values in the park. The cost of restoring Bjursjömyran is estimated at about SEK 250,000 and is covered by subsidies from the government’s wetlands initiative. “This is a one-off measure with many effects. Locally, we achieve greater biodiversity and a higher groundwater level, while reducing carbon emissions rom the bog and improving the water quality n the waterways that eventually flow into the Baltic Sea,” says John Granbo at the County Administrative Board.